The aviator collection stands for mission timers with a well-reserved sportive touch. 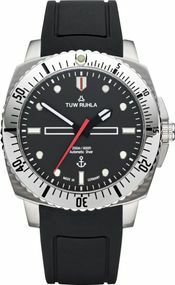 The clear dial makes reading the time really easy and the scratch proof sapphire crystal is well suited for use in the confined space of an aircraft cockpit. There are two versions with different movements: the Vostok 2415 Automatic and the VS75 Solar. Either driven by the movement of your wrist or by daylight. The 1892 feels just as much at home in everyday life as in special occasions and enjoys being your companion when you are wearing a suit. The slim profile, low weight, and reliable movement let you forget you are even wearing a watch - at least as long as you don’t need to know what time it is. Then just a quick glimpse at the clear dial will suffice. The ideal combination of the advantages of the Berlin Automatic with the practicality of a quartz watch. Expedition – watches with exchangeable straps and cases. One watch, many straps and cases. The Expedition series allows for a multitude of combinations, for anybody that loves a little bit of variation. With all of this variability, the Expedition still is a solid watch with a Swiss movement and a screw-down back that can withstand 10 ATM of water pressure. In 1978, Mr. Sigmund Jähn was the first German to travel into space with the Sojus 31 and spent a few days on the Saljut 6 space station. 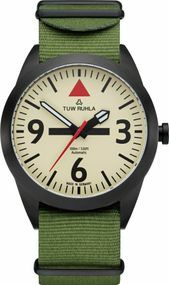 During this flight, he wore the predecessor of this Ruhla watch. This retro timepiece commemorates this notable event of the first German in space wearing the first German watch in space. With its sportive presence and its practical timing feature of the chronograph movement, the Rallye is the perfect time instrument for any racing enthusiast. 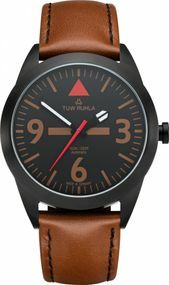 The watch also features a very slim profile and especially the silicone strap version is very comfortable on your wrist. The Solaris combines extraordinary design with reliable solar movements and its flat and light construction is very comfortable to wear. A timepiece not just for worshippers of the sun: even if the Solaris is not exposed to sunlight in the course of the whole day, the watch’s power reserve ensures that it will continue working for up to six months. Vostok-2415 Automatic movement with 31 jewels and shockproof balance, screw-down crown, solid case, divers bezel – all of this makes the Taucher an extraordinary and solid companion for any kind of mission up to a depth of 200 metres. But also on land you will certainly enjoy wearing it. 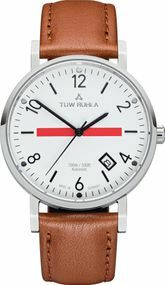 The Thuringia is a watch for self-assured purists that would like to understate rather than impress. The solid automatic movement with 28,800 beats per hour, the refined case, the low weight, and the scratch-proof sapphire crystal make the Thuringia a reliable time instrument for any occasion. While in its heart the same high-tech movement of the regular Thuringia is ticking away, the dial and colours are that of former decades. Retro without compromises. You like the iconic design of the Thuringia but you want a slimmer and lighter timepiece? Then the Thuringia Quartz is just what you have been looking for! You like the iconic design of the Thuringia but you want a slimmer and lighter timepiece? Then the Thuringia Vintage Quartz is just what you have been looking for! With its easy-to-read dial and classic case in combination with its useful time zone feature the Tourist is anything but boring. The watch with its additional 24h hand makes use of extraordinary designs of the 60s but reinterprets them completely. At its heart a Vostok 2426 movement with 31 jewels and shockproof balance spring is performing its service. Combining a modern zeitgeist with the designs of Ruhla watches from past times is at the heart of our collection. 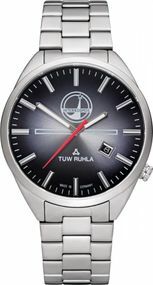 No matter if you are looking for a sportive, elegant, or extravagant watch, you will find the right line in the TUW Ruhla collection. Sigmund Jähn wasn't soley the first German in space, but during his flight he wore the first German watch in space. It was a special made Ruhla model. He was also carrying out some reaction time experiments for the Ruhla watchmakers. TUW Ruhla is now starting the trial assembly. The first samples are now ready and being tested to improve assembly and quality. TUW Ruhla now supports the German space travel exhibition in Morgenröte Rautenkranz.